Eye puffiness, eye bags, and dark circles have many causes: a cold, a sinus infection, seasonal allergies, sleep deprivation... or the fact that you spent the night prior sobbing uncontrollably while watching a tearjerker on the Hallmark channel. The most common treatment for this unattractive ailment involves placing cold cucumber slices on your closed eyelids for 10-15 minutes. You can also use something similarly cold such as cold potato slices, chilled tea bags, cold metal spoons, or a bag of frozen peas wrapped in a towel. For a more aromatic and indulgent self-spa treatment, you can also use crushed mint leaves, almond oil, or a cotton ball soaked in rose water to help reduce eye puffiness. However, if the dark circles under your eyes persist, you may want to consider seeing a doctor to ensure that the blemishes aren't indicative of a more serious problem. And if none of these remedies worked for you, definitely check out my followup list for more home remedies for treating dark circles under your eyes. 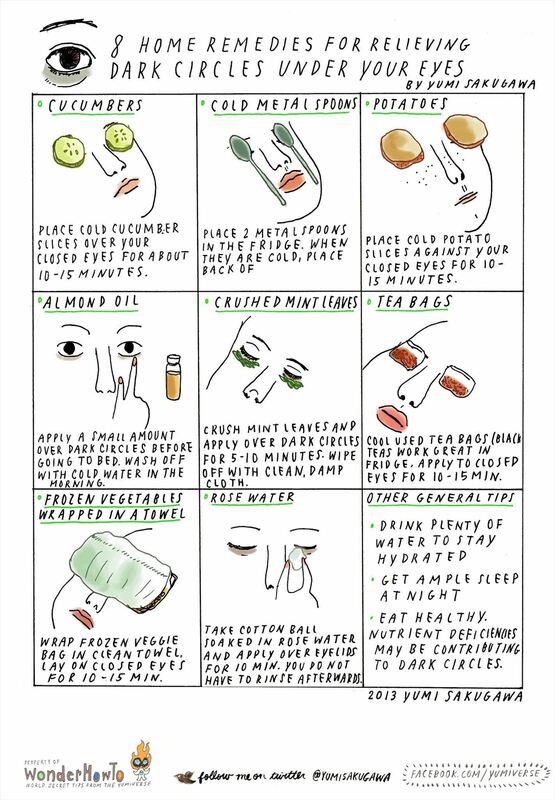 Got your own personal home remedies for treating dark circles under your eyes? Share them with us below. Thanks a lot, Yumi! Here's to 60 more years of youthfulness! Use Preparation H (yes, you read that right), or other creams for hemorrhoids. It's a vasoconstrictor (shrinks blood vessels). I dab it on rather than spreading it on, ONLY under the eyes, NEVER on the eyelids. This is why any amount of fluid shift is very noticeable. Alternatively, when you become dehydrated your eyes will become sunken. Moisturize, I use organic coconut oil from the grocery section of a store (not from the Health & Beauty department). It's odorless, melts quickly from body heat (the thinner/finer the eye cream the better). I also have a mask with those little gel-like beads in them, I can heat up under warm/hot water for sinus problems (DO NOT microwave, it may burst), or chill down in a freezer (DO NOT freeze, it may burst) or in an ice bath, great for puffy eyes, and eye strain headaches. The frozen bag of vegetables are great to use also. I find peas are the best for their small size. The skin under your eyes (and eyelids) are the thinnest in your body (use your ring finger to apply makeup around the eye....this finger is the weakest and applies the least pressure). The skin being the thinnest is why any amount of fluid shift is very noticeable. Alternatively, when you become dehydrated your eyes will become sunken. The veins under them are very prominent when you are tired because your adrenal glands are being squeezed dry to make cortisol and other sympathetic hormones to try to keep you awake. Cortisol act to enhance the activities of your sympathetic hormones such as epinephrine. Epinephrine, as any doctor can tell you, cause vasoconstriction. However, when you are tired, your adrenal glands become "tired" and produces less cortisol and sympathetic hormones. This results in more vasodilation and venodilation, manifesting as more blood flow and a darker tone of the skin under your eyes. I am going to try cucumber slices first. I found ZINC CREME ,($10.00 ) , to help as well! I am sleeping thru the night, only get up once maybe twice at night. I have had a persistant rash that is just below my chest. It is a spotty here and there rash. It is concentrated to just below my chest and is the full length from left to right. I have tried numerous stuff to get rid of it. It only itches once in a while. Anyone have any ideas?? I am going to look into generic herbal soaps. Oh. the rash does tend to spread when itches. THANK YOU!! Larry K.Parent,Naples,FL. Dermalmd under eye treatment serum is best way to get rid of dark circle under eyes I absolutely love this serum! Not only has it dramatically decreased the puffiness under my eyes but also the dark circles. The skin is very thin under the eye anyway, but Dermalmd serum has helped smooth and tighten the skin. I am a red head with sensitive skin and this serum is hands down the most gentle and effective product I have used in my 45 years.